There's a post on farce book from 2box saying: "I spy with my little eye something ending with Three....... ‪#‎Musikmesse2015"
Maybe they are hinting at the 2box MKThree? I converted a cheap pearl snare 14" to electronic using a trigger bar from r-drums and I'must say it's awesome! It triggers perfectly out of the box! just minimal tweaking to make the rim less hot but overall it's pretty good. For those in Europe who are trying to convert their a-kits should give rdrums a chance. Alan did a small review in the latest dig drum mag and as well. Setup guides and tips / 2box routing, where and how do I connect my stuff? Connect a roland PM-03 monitor using both outputs R+L, not only mono. how and where? which output should I use from the module, and how do I set up the routing so that the throne thumper responds to low frequencies from all the drums but not from the line-in input? Private - for sale / wanted / *SOLD*2box Module for sale, shipping worldwide. DrumIt 5 Hardware / Record 2box into iPad, which cables? So, I bought a line 6 mobile in interface for my iPad in order to record my playing into it. Now, I'm using output 1 from the 2box into the line in of the interface using an adaptor. My problem is that I'm getting only a mono channel in my headphones.... (I set garageband to receive stereo) In my 2box I left the out to "MIX". Do I need then another cable from output 2 and then both 1+2 cables into a single iPad cable? Do both cables have to be mono or stereo? or it doesn't matter? Frohe Ostern an alle deutschsprechenden 2boxer! 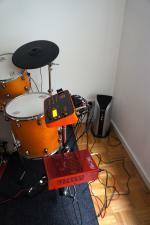 General 2box Drumit 5 forum / New 2Box in the Musikmesse? I was there last year and it was impressive, too many things to see, sadly this year I can't make it but eagerly expecting for some 2box surprises this year! I don't know if it was for low sales or whatever but this is indeed bad news I reckon. So if you are already the proud owner of a 2box consider yourself lucky and for all who didn't order theirs while it was available well, the only option now is to import it directly from Europe or wait for a new distributor to appear. disgruntled 2boxer: "Hey, my kick is broken or something. I'm in Australia"
2box: I'm sorry to hear that, but you will have to send the kick to your nearest distributor for repair, which in your case is...ehm, let me see New Zealand.